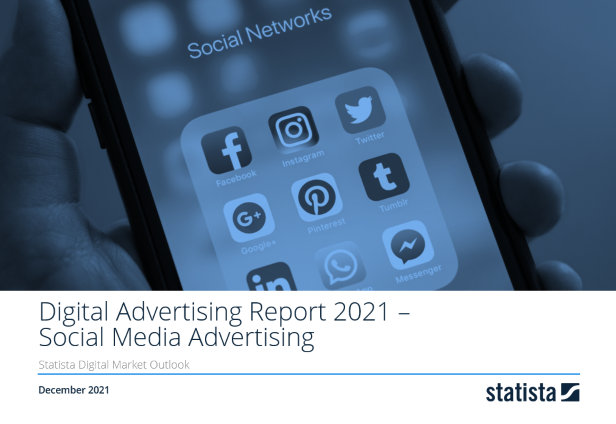 Revenue in the Social Media Advertising segment amounts to US$20,562m in 2019. Revenue is expected to show an annual growth rate (CAGR 2019-2023) of 19.5%, resulting in a market volume of US$41,989m by 2023. Social Media advertising includes all ad revenue generated by social networks or business networks such as Facebook, Twitter or LinkedIn. Ads in social networks can appear as sponsored posts within organic content or besides the newsfeed. Social advertising does not include revenue generated from membership-subscriptions or premium fees. All figures refer to gross values. Reading Support Ad spending in the Social Media Advertising segment amounts to US$20,562m in 2019. Reading Support The Social Media Advertising segment is expected to show a ad spending growth of 29.0% in 2020. The “Ad Spending” box shows the forecasted development of the selected market (market segment, region) for each year. Reading Support With a market volume of US$34,902m in 2019, most ad spending is generated in United States. Here you can find more studies and statistics about "Social Media Advertising".